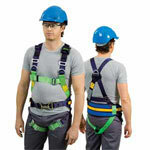 Full body polyester webbing harness with Prospector miner's belt incorporated. Frontal fall arrest attachment point and rear dorsal dee. Easy to don with fully adjustable chest, shoulder and leg straps. Padded belt for carrying a battery pack and self-rescuer. Label pack with lanyard parking ring stores harness documents. 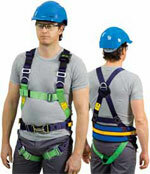 Full body polyester webbing harness with Explorer miner's belt incorporated. Shoulder straps with retro-reflective tape. Equipment belt with battery pack and self rescue straps. Padded 100mm back for support. Double acting attachment hook at front. Not to be used for fall arrest, limited fall arrest or restraint. Miners equipment belt with battery pack, self rescue straps and retro reflective tape. Padded 100mm back for additional support. Battery and self rescue straps. Shoulder straps with retro reflective tape. 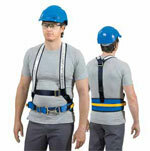 Used in applications such as line and pole top work, pole straps support a worker on a pole. Fitted with an adjuster which easily adjusts the working length. A protective sleeve to lengthen the life of the webbing. Double acting 19mm opening hooks at each end. Available in various lengths to suit different applications.